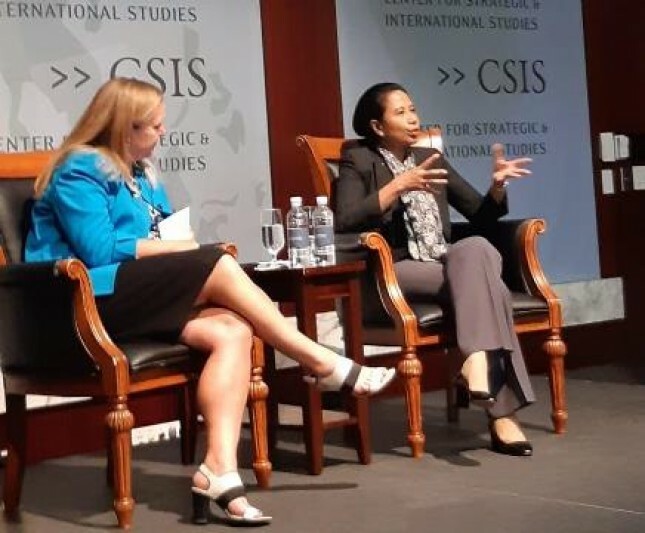 INDUSTRY.co.id - Jakarta - SOE Minister Rini Soemarno describes the performance achievements of President Joko Widodo's government during the last three years or 2014-2017 at an investment forum event in Washington DC, United States. Minister Rini in her presentation explained that Indonesia is currently the 15th largest economy in the world and also the 3rd fastest growing among G20 countries. The ease of doing business in Indonesia, she added, rose from 120th place to 91rd in the world, followed by an investment increase of 50 percent. "Not only that, national electrification jumped from 84 percent to 95 percent. The poverty, unemployment and inequality rates all declined. With a series of encouraging developments, signifies the future of Indonesia's better and brighter, "said Rini. Minister of SOEs explained Indonesia is also ready for the digital economy. The presence of 3G and 4G network support has brought Indonesia to leap into the digital age. In the past five years, Internet access has jumped from 22 percent to 50 percent. The "financial technology" sector is also growing with the "startup" line that offers a wider range of financial services. "We see great potential in the digital economy and SOEs in Indonesia are embracing digital in a big way. We have embarked on digital transformation in all sectors, from energy, finance, telecommunications, public services and logistics. We believe this is just the beginning, and we look forward to more many more innovations in the future, "said Rini. Positive achievement is not separated from the performance roles of all state-owned companies. The total income of all SOEs in 2017 reaches 151 billion US dollars, equivalent to 15 percent of Indonesia's GDP. BUMNs listed on the capital market floor represent 25 percent of the total market capitalization of Indonesia. In fact, the collective assets of Indonesian SOEs have reached 538 billion US dollars. "It means as a group, the total assets of our BUMN are bigger than Temasek (Singapore) and Khazanah (Malaysia) although both assets are combined," explained Rini. The total equity of SOEs in 2017 also increased quite well to 179 billion US dollars from the original 168 billion US dollars in 2016. So too with the total net profit of state-owned enterprises increased from the original 12 billion US dollars in 2016 to 14 billion US dollars at the end of 2017. Rini continued, since 2015 it has done a lot of transformation in the body of BUMN with the aim of strengthening the participation of state companies in spurring economic growth in various regions in Indonesia. To achieve these objectives, the SOE Ministry develops a strategy that focuses on four pillars: creating synergies across SOEs, focusing on down streaming industries, improving local content across projects, integrating development businesses, and enabling financial independence. One example is the 35 GW generating program carried out by PT PLN (Persero). This electrification aims to accelerate industrialization and improve the ease of investment in Indonesia through the assurance of electrical reliability. The government is also focused on expanding capacity for renewable energy including geothermal, wind and biofuels. Do not stop there; the Government of Indonesia also accelerates land connectivity infrastructure projects through toll roads and trains. In the last three years, toll road length has increased to 1,092 kilometers or up 33 percent compared to 2014 which only reached 820 km. In 2019, the toll road is targeted to reach 1,580 km. These new toll roads will connect from east to west on the island of Java and north to south on the island of Sumatra. "In addition, we are building a variety of land transportation to serve us public such as the LRT light rail in Jakarta and Palembang," said Rini. Development is also supported by the development of sea and air connectivity. All the progress and acceleration of the infrastructure are prepared as future efforts to accept the presence of investors, said Rini.